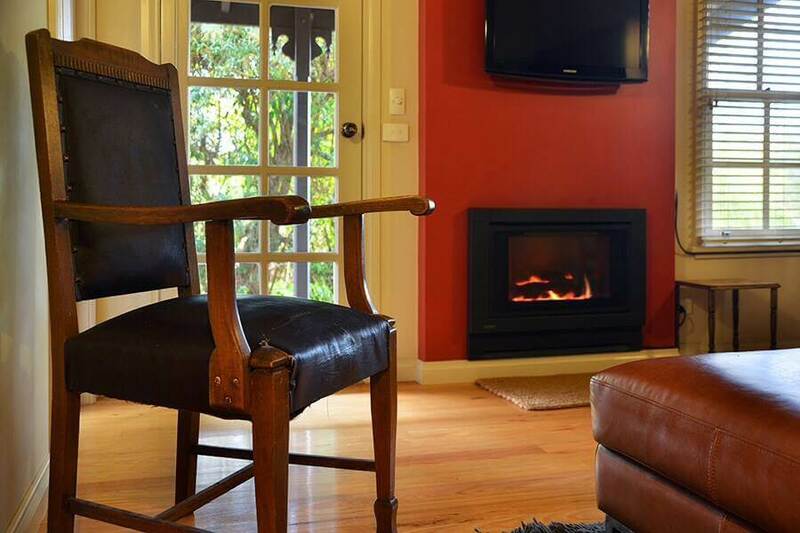 Circa Red London is 1 of 3 gorgeous cottages located only a short walk from central Daylesford. With one bedroom and a warm and cosy ambience, this property has everything you will need for that weekend or midweek stay in Daylesford. Call us on (03) 5348 2008 for more information. 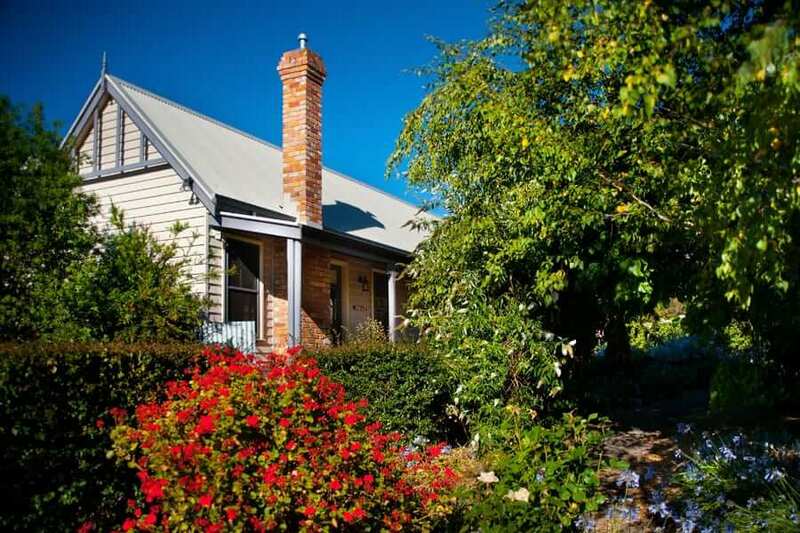 One of three semi-detached, adorable weatherboard cottages in the heart of Daylesford. Accommodating up to 2 guests with one beautifully appointed bedroom and a bathroom, Circa Red London oozes intimacy and comfort. Much like its mirrored sister properties, Ivy Prince and Ruby Mint, this home is a great way to experience Daylesford. The cottage’s indoor space is split between the spacious living room and the bedroom with its en-suite. The living area is brightened by natural light filtering in through the windows and glass doors, which offer views of the garden. 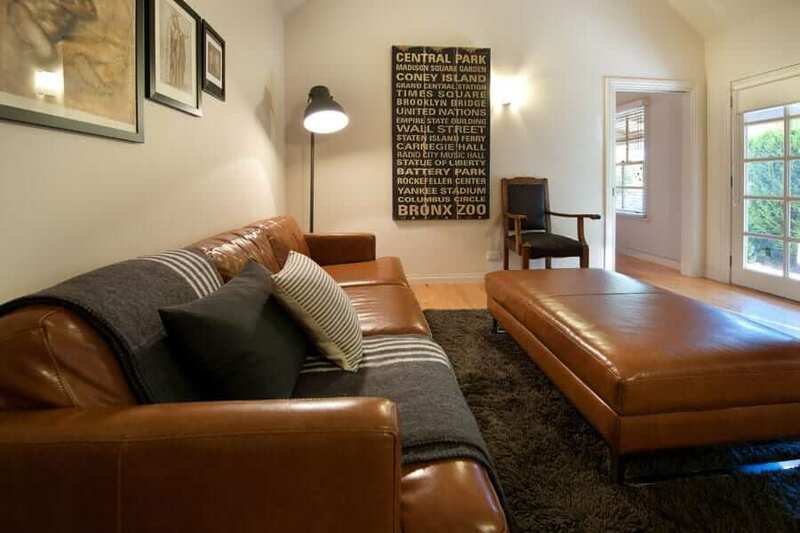 A large, plush leather couch invites lodgers to relax and watch some TV. For chilly nights, get the fireplace crackling and enjoy the intimate atmosphere. The bedroom is comfort defined. The queen bed sits with an elegant white canopy in the centre of the room. Beautiful artwork adorns the walls, lending the space character. The well-appointed bathroom offers a spa bath as well as a shower. Split system heating and cooling guarantee an ideal temperature whatever the time of year. Nestled in amongst the beautiful foliage and colourful flowers of its own garden, Circa Red London has a feeling of privacy and serenity to it without being too far away from the goings-on of bustling Daylesford. The home has a deck covered by the verandah with seating, making a great spot to put your feet up and enjoy some morning tea, or to admire the garden as the sun goes down. Whether it’s booked on its own or alongside its sister properties, Circa Red London will offer holidaymakers a cosy, luxurious experience in the lively heart of Daylesford. A quiet little place in the heart of Daylesford. A great place for a couple escaping to the country for a weekend. Warm and inviting. Red Cottage is an absoutely lovely place to stay. It is located in a very quiet spot, yet within a few minutes walk into town. Everything was well provided for, including good mueli for breakfast. The spa bath is lovely, & so relaxing. We were warm with the two heaters. The bed was very comfortable, & warm. The hosts, Theresa & Tony, were fantastic with their quick responses. Beautiful cottage, conveniently placed almost a minutes walk from main street of Daylesford as well as a short walk to The Convent. Cottage tidy and clean with all necessities provided. Can't wait to return to this cute, warming home! You may be interested in our other properties – See what Circa Ruby Mint has to offer your next vacation, perfectly located in the heart of Daylesford, or check out Kate’s Place, or browse our other luxury choices in Daylesford accommodation.